Keratoconus is a frustrating eye condition to live with due to distorted and blurred vision. 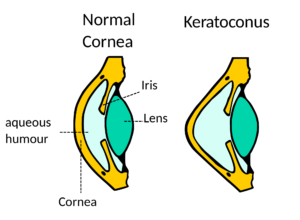 Corneal ectasia – a complication after refractive surgery such as LASIK will also cause vision issues. Many patients believe that a corneal transplant will fix their vision if they have these conditions. Studies show that this option failed to provide satisfactory visual correction. Patients with corneal transplants end up with a high or irregular astigmatism. Scleral contact lenses are large diameter lenses that vault over the cornea and rest gently on the white part of the eye. Since the lens is filled with solution before insertion, it creates a medium of clear fluid that neutralizes the corneal irregular astigmatism. Scleral lenses not only improve vision but also are specially designed to help patients who suffer with dry eye. Dr. Achong-Coan is a contact lens specialist in the Orlando area who has been fitting scleral lenses for over 15 years at Coan Eye Care. She is a fellow of the Scleral Lens Society and a fellow of the American Academy of Optometry. If you or you know someone with any of these conditions, call us today at Coan Eye Care to see if you are a candidate for scleral lenses.